An Airbus A319-114, N349NB, operated by Northwest Airlines as flight NW853, experienced an engine fan cowling separation while on approach to land on runway 27R at the Detroit Metro Airport (DTW), Michigan. The pilot, co-pilot, 3 flight attendants, and 68 passengers on board were not injured. The airplane received substantial damage. The flight originated from New York-LaGuardia Airport (LGA), at 06:18. The accident flight was the first one for the airplane after having maintenance performed on the number two (right) engine during the previous evening. The first officer reported he used a flashlight when conducting his preflight inspection of the airplane as it was still dark outside. He reported the engine cowlings were flush, and he did not see any "hanging" cowl latches when he looked underneath the engines. The captain reported that the logbooks indicated the number two engine vibration monitor had been replaced during the previous night. He reported the preflight, taxi, and takeoff were normal. The captain reported that during climb out the cockpit received a call from the lead flight attendant who informed them that a passenger reported that the number two engine cowling was flapping after takeoff. A pilot-passenger who was sitting behind this passenger reportedly did not see the cowling move, nor did the flight attendants when they looked out the window. The captain reported he then began to monitor the N1 vibration indications on the number two engine. 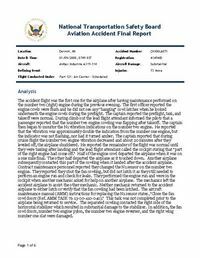 He reported that the number two engine vibration was approximately double the indication from the number one engine, but the indicator was not flashing nor had it turned amber. During cruise flight the number two engine vibration decreased to equal that of the number one engine. The captain reported that about 20 minutes after they leveled off, the airplane shuddered as if flying through wake turbulence. He reported the remainder of the flight was normal until they were taxiing after landing and the lead flight attendant called the cockpit stating that "part of the right engine had come off." The first officer called ground control to warn them that there might be debris on the runway. The crew then shut down the number two engine and taxied to the gate. The pilot of another airplane later reported seeing part of the engine cowling come off when flight 853 was on a 1-mile final. The other half of the engine cowling was found on the runway and was contacted by an airplane that landed after the accident airplane. Contract maintenance personnel reported they changed the N1 sensor on the number two engine during the evening prior to the accident. They reported they then shut the fan cowling, but did not latch it as they still needed to perform an engine run and check for leaks. After the engine run was performed, one of the mechanics thought that the other had latched the fan cowling when in fact he had not. While they were doing another task in the cockpit, another mechanic asked for help at another gate. The mechanics left the accident airplane to assist the other mechanic. Neither mechanic returned to the accident airplane to either latch or verify that the fan cowling had been latched. The maintenance log stated the N1 speed sensor was removed and replaced in accordance with aircraft maintenance manual (AMM) 77-11-10. This section of the AMM states, "Close the fan cowl doors (Ref. AMM TASK 71-13-00-410-040)." According to the maintenance personnel, this task was not completed prior to the airplane being returned to service. The separated cowling contacted the right side of the horizontal stabilizer which resulted in substantial damage to the stabilizer. In addition, the fan cowl doors, number two engine pylon, the number two engine reverser, and the right wing number one slat were damaged. The separation of the engine cowling which resulted from maintenance personnel failing to follow maintenance procedures in that they did not latch the engine cowling following the maintenance inspection. A factor associated with the accident was their attention was divereted from the task when another mechanic asked for assistance. Distance from New York-La Guardia Airport, NY to Detroit-Metropolitan Wayne County Airport, MI as the crow flies is 800 km (500 miles).